Thanks to all participants for a successful and interesting Field Day 2018. Where we usually distribute stations around the site, near the antennas they will use, this time we put all of our stations in a 20x30 foot central shelter. The weather was clear and sunny, so the walls were a little bright for the computer screens, but it was plenty roomy, and we had a nice floor made of 4x8 sheets of plywood provided by W7MKE and engineered by KR7W. There were a few bumpy spots, for which our safety officer KF7SCB required suitable remediation. But mostly the rolling chairs functioned very well. The single shelter allowed a simple, wired computer network, where in previous years, with distributed shelters, we employed a mesh network based on Broadband HamNet. The wired network suffered mainly from susceptibility to RF on the part of the UPS that powered it. The poor UPS clicked and clacked during transmissions (but did not lose power) -- a problem to anticipate next year. We used a single power generator this year, with commercial-grade power distribution cables and substations that the Club has not pulled out of storage for many years. A couple of GFI devices were troublesome but easily avoided once diagnosed. Thanks to K7MO for the original construction and, this year, adapting the master panel to the Club's current generator. Last year's effort suffered from a lack of isolation between stations. This year, we employed common-mode chokes both near feed points and near the radios, and we increased the distance between our 20M yagis to approximately 300 feet. We were pleased to find that interference was minimal. With a single shelter, maintaining isolation between antennas required long runs of feedline that we have not required in the past. This seemed to work out pretty well for the 20M CW yagi, but the 20M Phone yagi turned out to be resonant somewhere around 14.6 MHz, and the resulting high-ish SWR, coupled with a 300-foot feedline (low-loss, but still...), may have cost us some power. The mis-tuning was unexpected, and since the AB-577 military tower does not lend itself to a quick down-and-up, we chose to live with it, possibly to our detriment. 20M phone Qs were down this year. We had extension-ladder towers for our 5-element 15M and 10M beams. We made more contacts on 15M than we really thought we would, but very few on 10M. Our 40M, 3-element wire yagi and catenary dipole performed well, as this antenna system always does. For 80M, this year, we managed some additional height on the inverted vee, around 80 feet at the apex and 50+ feet at the ends. The noise level was surprisingly low at S1-2, a huge improvement over previous years. Extra common-mode choking may have helped. We tried a 6M, horizontally-bent dipole (giving roughly an omni pattern), at about 70 feet elevation. One of our operators dubbed it "the oven element antenna". It worked pretty well, and we made some local contacts, but alas, no E-layer skip occurred while we were operating on 6M. In the evening, we lifted a full-size 80M half-wave vertical dipole, of a design similar to a "sleeve" dipole, but in this case the coax-shield functions as the sleeve and lower half of the dipole. A common-mode choke "terminates" the bottom section. We estimate the top reached about 200 feet, putting the bottom at about 70 feet. It loaded well, and it was no noisier than the inverted vee, but conditions apparently were such that we did not hear or work stations more easterly than mid-continent, even with the expected low-angle radiation from this antenna. After midnight, we lifted a full-size, quarter-wave monopole for 160M, employing two elevated radials, all terminating on top of a 10-foot step ladder. We had plans for a beverage receiving antenna about 500 feet long, but we did not come up with the wire for it and will have to try that again next year. Noise on the vertical was very high, although we did work three strong CW stations in OR and BC. Maybe that was ground-wave, as the vertical should not have worked well at all for such close-in stations. We also lifted a GoPro camera, along with the 80M vertical dipole. The views from 200 feet are impressive. The balloons had no trouble lifting any of the loads we hung from them. We went for the full safety regimen this year and earned the 100-point bonus in this category. 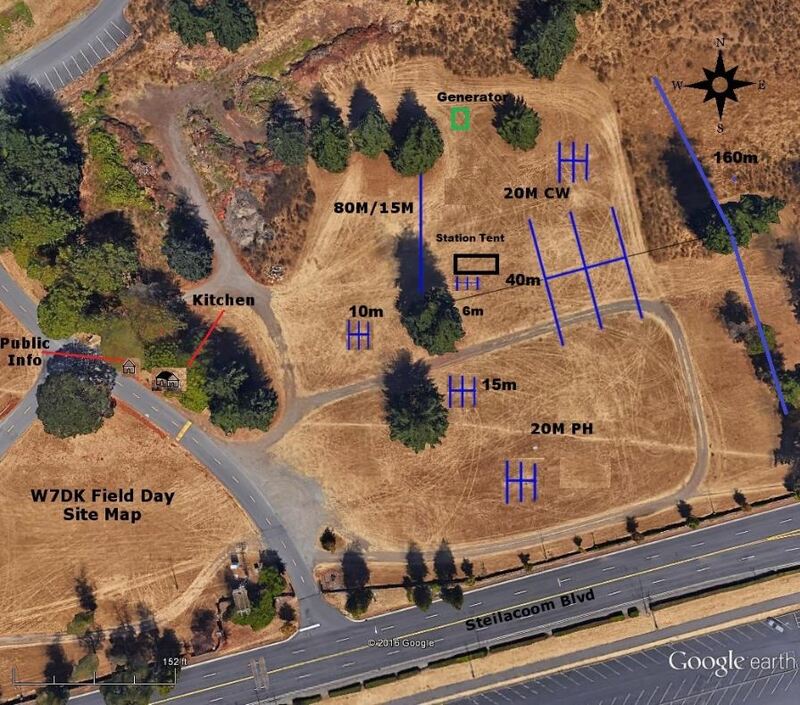 NG7G filled many roles this year, including managing the 40M station and shooting five lines over the trees, three of which reached 100 feet or more. KG7ZYB was foreman of the crew that erected the AB-577 towers ("rocket launchers", in our vernacular) that supported our 20M yagis. As in previous years, we worked our alternate-power QSOs by means of AC7QN's bicycle-driven generator and IC-817 radio. These 40M QSOs, made during the middle of the day on Saturday, were a bit hard-won, but NG7G is young and strong, and he kept the electrons flowing through the generator. 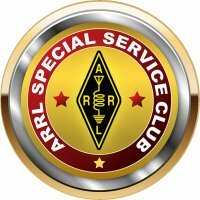 By contrast, we enjoyed watching the Club's oldest member make a number of QSOs on 20M CW, using a straight key. W7WG is approaching 100 years old and has been a ham since 1935. As usual, we were blessed with fine victuals provided by Chefs W7PFU and K7HTU: pizza during Friday setup, grilled cheese sandwiches for lunch on Saturday, chicken and ribs Saturday evening, and the famous "Logger's Breakfast" Sunday morning. N7NCP and KF7KSW attended our Public Information Table. We were pleased to receive a number of visitors who were not Club members, a few of which stopped spontaneously after seeing our signs and antennas just off of busy Steilacoom Blvd. on the grounds of Western State Hospital in Lakewood, WA. Our sign-in log recorded about 75 names. Striking the site after 11 AM on Sunday somehow always proceeds more smoothly than one would expect, considering how much work went into putting everything up. We were off the field by 2 PM. Our Field Day Coordinator, W2NCC, was pretty tired by that time. It was his second year. Will he be a sucker and go for a hat-trick? Tune in next year to find out.